Want to learn how to track Facebook users in Google Analytics? Knowing how many people come to your website from Facebook, and how they behave once on your website, is crucial to optimizing your site for more traffic and higher conversions. In this article, we’ll show you how to easily track Facebook users in Google Analytics. 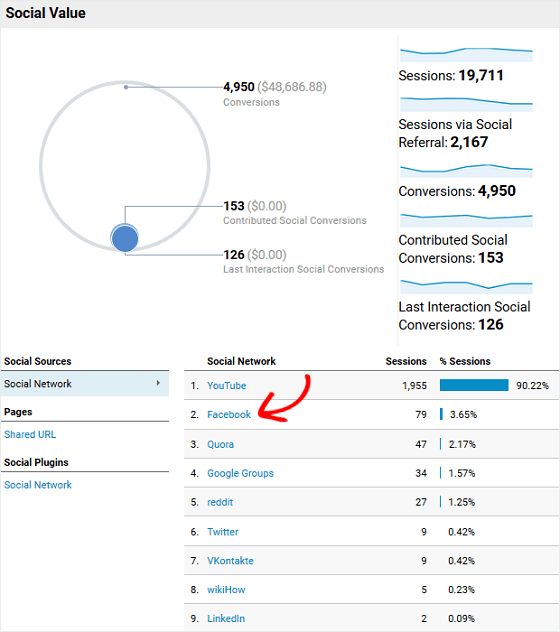 Why Track Facebook Users in Google Analytics? You want to track Facebook users in Google Analytics so you can see what’s happening once people land on your website from Facebook. This is in addition to viewing Facebook Insights to see what people are doing while on your Facebook page. With over 1.4 billion daily active users, Facebook is an ideal place to reach a wide audience base that is sure to be interested in what you have to offer. But since the announcement earlier this year that Facebook will focus more on family and friends moving forward, businesses have found that reaching their target audience on Facebook is harder than ever. As a result, tracking user behavior becomes even more important if you want to capitalize on the reach potential Facebook has. But what about what happens after a Facebook user clicks on a link and lands on your website? Without knowing what your Facebook audience is doing once they visit your website, you can’t possibly know whether your content marketing efforts are working. 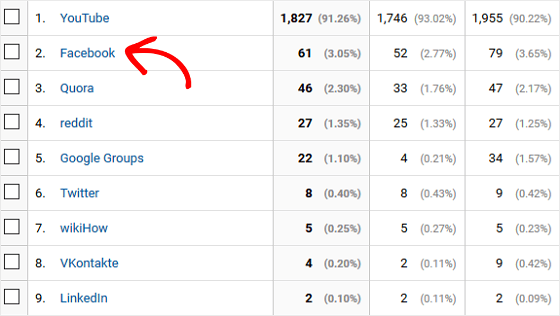 That’s why you should track your Facebook users in Google Analytics to see what happens after they engage with your Facebook page. If you haven’t set up a Google Analytics account, check out our helpful guides on why your business needs Google Analytics and how to set up Google Analytics for WordPress. The easiest way to find out how many Facebook users are coming to your website from Facebook is to go to Acquisition » All Traffic » Channels in your Google Analytics account. Here, you’ll see a list of traffic sources bringing people to your website such as organic search, direct traffic, referrals, and paid search. Click on Social to see a breakdown of social media networks bringing traffic to your site, including Facebook. Here you’ll see a general overview of what’s happening on your website on all social media networks. You can also compare this data to your website as a whole. For example, you’ll see how many people come from each social media platform, the number of sessions they initiate, and important data like bounce rate, pages/sessions, average sessions duration, and metrics related to eCommerce transactions if this applies to your website. Once you’ve found the breakdown of the different social media platforms, click on Facebook to see only the Facebook data. This will show you which landing pages your Facebook users are landing on as they arrive from your Facebook page. Click on Other near Primary Dimension and enter “Landing Page” into the search box until the option appears. Now you’ll be able to see which landing pages your Facebook users are landing on when they visit your site. 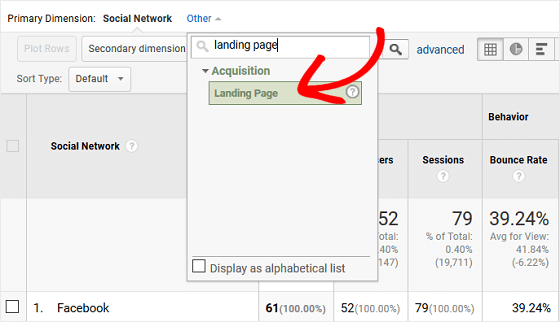 You’ll also see the Google Analytics metrics for each so you can decide which landing pages are converting the most, and which ones need improvements. If you don’t have an eCommerce shop, you can still monitor how many Facebook users come to your website. All you have to do is change the Conversions category. 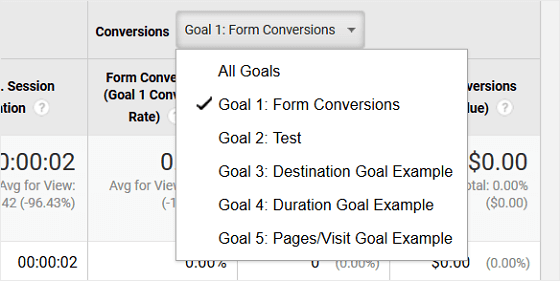 Here, you can change the category based on the goals in Google Analytics you’ve created for your website, such as form conversions, to see what your Facebook users are doing on your website as it relates to your site’s overall goals. Adding to that, you can use MonsterInsights, the best Google Analytics plugin on the market today, and the Forms addon to track form views, submissions, and conversions. This is especially great if you use the most user-friendly WordPress contact form plugin around, WPForms. The last place to look for a wealth of data about your Facebook users is under Acquisition » Social. From there, you have several categories that are driving traffic to your website from Facebook. You may or may not have traffic from all categories coming from Facebook, but it’s worth a look. To start, let’s take a look at the Overview section. Here you’ll see which percentage of Facebook users are coming to your site versus other popular social platforms. You’ll also notice data like the number of total sessions, session referrals, the number of conversions, and more. Next, check out the category Network Referrals. Here you’ll see where your site’s traffic originates from and their behavior once they land on your website. Next up is Landing Pages, which we talked about earlier. Again, this section will show you the landing pages your Facebook users are clicking on in Facebook. Lastly, if you click on the Conversions category, you’ll see each social network and the number of conversions each has. In addition, you’ll see the value those conversions have brought you if you’ve assigned your goals conversion values. And there you have it! 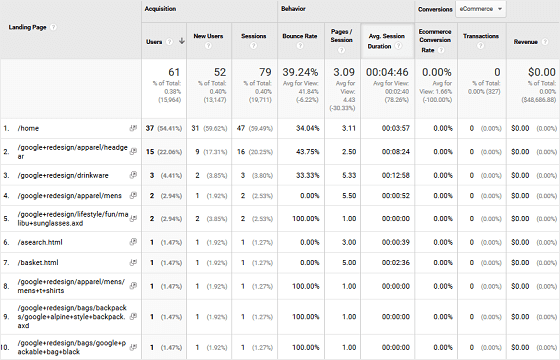 You now know how to easily track Facebook users in Google Analytics. Plus, you now know a little more about your Facebook users and what they do once they’re on your website. If you currently run Facebook ads and want to find out how they’re doing, be sure to check out our helpful tutorial on tracking Facebook ads in Google Analytics. And, of course, if you want to improve your ad campaigns, and make sure Google doesn’t record inaccurate conversions, be sure to check out the MonsterInsights Referral Tracking addon, as well as how to set up marketing tracking in Google Analytics so you’ll always know what’s going on with your social media ad campaigns.